Very quick post here. Next week is mold week, so I'm in the usual pre-mold panic, wanting to get all the details and surfaces resolved before it gets set in rubber. Not surprisingly, those areas that are the most regulated, symmetrical, parallel, etc., are particularly tricky. Straight, even, and smooth are not things clay does easily. That being the case, I've been spending a lot of time on the helmet, with it's raised concentric ridges, and the bow and arrows, which I had given a lot of thought to, and which I'd postponed working on because they dry out so fast. It turns out there's a lot to consider. Those long, straight shafts are tough to make feel solid, and then there's all kind of unexpected questions about what kind of arrows these would be. Initially, I had been thinking that the arrows would be extremely primitive; essentially just sharp sticks. Compositionally, however, that didn't work. 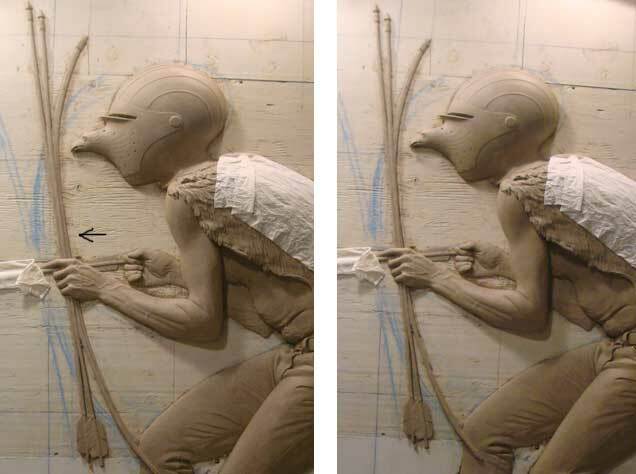 My simple arrows were just too light, and got lost against the bulk and detail of the figure. Turns out they needed fletching, and they need arrowheads. I teach part of a class on arrowheads (it was actually part of the original inspiration for this piece), so I had a lot of arrowheads to choose from. These are based on medieval armor piercing points, which I like because I like the brutal simplicity of the form, and also because they're so unexpected. Stone arrowheads would have felt too connected to Native American narratives, and the Japanese Yanone that I love would have been too heavy visually, and too hard to make in clay. In any case, I've been working and working arrows, overworking it really, and have not been satisfied. Something was not right. Then, last night, I did something that I never do - I made a creative decision past 9:00 pm. Usually, if I allow myself to make any big moves after dinner, I regret it in the morning. Last night, however, after laboring over the goddamn bow and arrow for a couple hours, I realized that the curve of the bow was wrong. There was a flat spot that didn't make sense. I've drawn an arrow pointing at it so you can see what I'm talking about, and also possibly see how crazy I've gotten. It doesn't look like much in these photos, but last night this was a big deal, and now, when I go out tonight, I know it will feel right, and that I'll get it done in no time. Those little revelations, where you didn't know there was a problem until you solve it, are simultaneously incredibly satisfying and insanely frustrating. Satisfying because you figured it out, frustrating because the answer was there the whole time, and you just didn't see it.